Well, the day has arrived for one of the big highlights of the trip. Actually, that’s not true. Let’s just say that this is another of the many highlights of this trip. When booking the trip, the wording suggested that we could ride to the Grand Canyon or take the train. I had planned to give the bike a rest and take a leisurely trip on the train. As it turned out, taking the bike was the better bet because it gave us independence and fitted in better with travelling as a group especially for those wanting the helicopter trip – and we did! The Grand Canyon is about 60 miles north of Williams and so all of us took an easy ride – it was effectively one long straight road with little chance of getting lost. Only Bill and ourselves had elected to take the helicopter trip. This would be Françoise’s first pleasure trip in a helicopter. The only other time she had been up in a helicopter was when she was rescued from the French Alps. I had planned to treat her to a trip over Niagara Falls in a helicopter some years ago and we almost did it. It was all booked and we were at Niagara when we were told that all flights were grounded – that day was 9/11. Today, there was no such problem and Gary took us to Maverick Helicopters where we waited for our flight. Our pilot was called Tanner and the helicopter was very comfortable with headsets and microphones so we could all talk to each other. Tanner had been with Maverick for a year and was an experienced pilot making up to 9 Grand Canyon flights per day. He had lost his leg in a work accident 8 years earlier and was air-lifted to hospital in a helicopter and that’s what gave hime the desire to fly helicopters. The flight lasted about an hour and there was a real moment of awe when we crossed the rim and saw into the canyon. 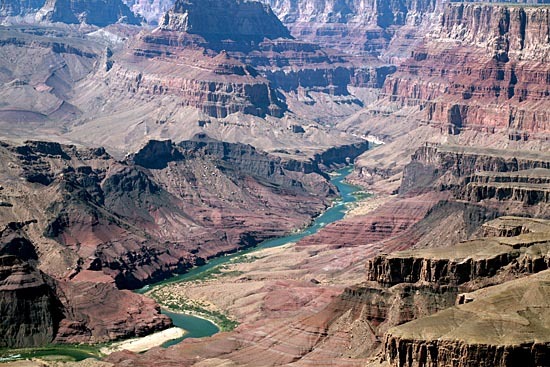 Seeing it from the air is an amazing experience and even then it is not possible to gauge the size of the canyon – it is, after all, 277 miles long, an average of 10 miles across, and up to 1 mile deep! The helicopter flight is highly recommended. After the flight, it is possible to purchase a video of the actual flight which had been recorded by a camera in the helicopter with the data being written to a hard disc in the helicopter and handed over to the ground crew for making DVDs afterwards. It isn’t HD quality but serves as a great reminder of a memorable experience. We then had lunch at We Cook Pizza (what an original name for a pizza restaurant…?). Afterwards, we rode into the Grand Canyon National Park, took a right and headed out to Desert View, a vantage point some 30 miles east. We saw lots of dead trees catching the sun on the way in and made a mental note to stop and photograph them on the way out. We rode with Bill to Desert View and stopped there for some time taking photos. Apologies for all the canyon photo shots in today’s gallery but there is so much to see. It is very difficult to capture the enormity and grandeur of the Grand Canyon in a small two-dimensional image and it’s a place you really have to see with your own eyes to appreciate. Since the canyon stretched so far and heat haze and UV degraded the scene, I tried to capture shots with trees and other objects in the foreground to give some sense of scale and used the canyon as a backdrop. On the way out, we stop for the dead trees and spend several minutes there with our cameras. We check in with Gary as we exit the park and make our own way back to Williams. We wanted to have some time to wander round Williams with our cameras once more as it is such a photogenic town and the low evening sun adds mood to these shots. On the way back we could still see the tremendous cloud of smoke over the national park to the east where the forest fire was still raging. The blaze consumed 14,000 acres, engaged 800 firefighters and caused 1,000 residents of Flagstaff to be evacuated. The fire was believed to have been started by an abandoned camp fire. We decide to eat in town that evening and so I ask one of the locals for advice on a good place to eat. We would like to have tried Twisters but it was Sunday and it was closed. We were recommended to try the Red Raven which was a little more expensive but the food and hospitality made it worthwhile. When we left, it was dark but still warm and we took a slow wander back to the hotel and our bed.